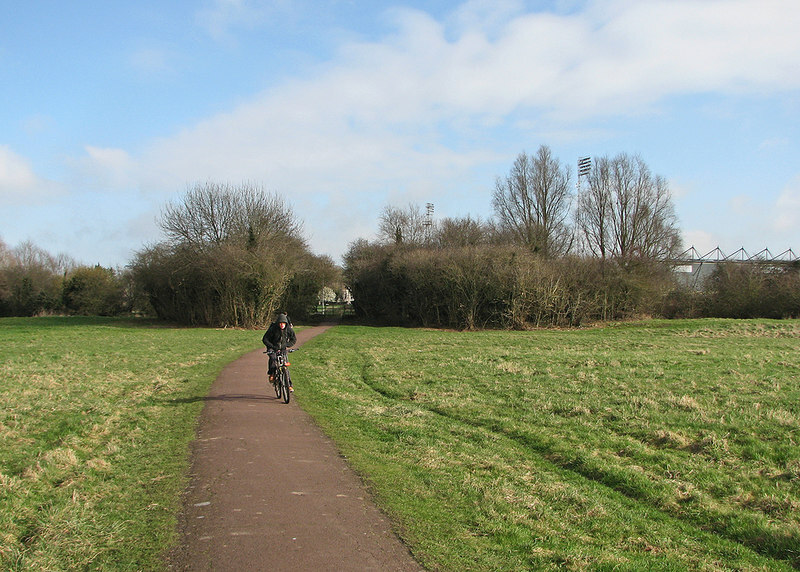 Is there a right to cycle on common land? Cycling across Coldham's Common, Cambridge. There are plans to upgrade to a formal cycle track across the common. On the face of it, the answer is 'no'. Leave aside public roads (including byways open to all traffic), restricted byways and public bridleways (which cyclists may use subject to an obligation to 'give way to pedestrians and persons on horseback': s.30 of the Countryside Act 1968, an obligation which is presumably integral to the offence of cycling 'without reasonable consideration for other persons using the road', under s.29 of the Road Traffic Act 1988). On the majority of commons to which there is a public right of access under Part I of the Countryside and Rights of Way Act 2000 (CROW), the right is, 'to enter and remain on any access land for the purposes of open-air recreation' (s.2(1)) subject to the general restrictions in Sch.2. And para.1(a) of Sch.2 sets out that the right does not entitle a person to be on land if that person, 'drives or rides any vehicle other than an invalid carriage'. Let's park for a moment whether a bicycle is truly a 'vehicle' for the purposes of Sch.2. But CROW is not the only statutory right of access to common land. Prior to the enactment of the CROW rights, many commons — often estimated at one fifth — were subject to rights of access conferred under older laws, and these were preserved by s.15(1): the commons to which such pre-CROW rights apply are therefore often referred to as 's.15 commons'. The most significant of these pre-CROW provisions are the 'rights of access for air and exercise' conferred by s.193 of the Law of Property Act 1925. It is a right exercisable on commons which are now, as a shorthand, described as 'urban commons', but strictly, commons which, immediately before local government reform in 1974, were in the (London) Metropolitan police district, a borough or an urban district, and commons to which s.193 has been applied by virtue of a deed (revocable or irrevocable) executed by the owner under subs.(2). Do the s.193 'rights of access for air and exercise' apply also to cycling? There has been no case directly turning on s.193, but the conventional view is that they do not. Classically, a bicycle is considered to be a carriage, and carriages are excluded by para. (c) of the proviso, as are 'other vehicle[s]'. Indeed, it is an offence to draw or drive these things on a common under subs.(4). The report does not tell us whether counsel sung the words, but he did point out, to no avail, that the song recognises what the law perhaps does not — that a bicycle is not a carriage. • Taylor v Goodwin (1879), which found that riding a bicycle was 'driving any sort of carriage' for the purposes of s.78 of the Highway Act 1835, and so the appellant was guilty of furiously driving a carriage. S.85(1) of the Local Government Act 1888 subsequently provided that: '… Bicycles, tricycles, velocipedes, and other similar machines are hereby declared to be carriages within the meaning of the Highway Acts…' (just about the only provision of that Act which remains in force: the ellipses refer not to omitted text, but to the repealed words in the section, of which the words quoted are the only words which remain extant). In the late C19, the Highway Acts provided not just for the management of highways, but the regulation of traffic using them: legislation which (greatly evolved) is now found in the Road Traffic Act 1988 and the Road Traffic Regulation Act 1984. • R v Parker (1895), a cyclist was a person 'having the charge of any carriage or vehicle' under s.35 of the Offences against the Person Act 1861, and so guilty of causing bodily harm by furious driving. • Ellis v Nott-Bower (1896), a bicycle was a vehicle used for displaying advertisements contrary to s.12 of the Liverpool Corporation Act 1889. • A cluster of toll road or turnpike cases, Williams v Ellis (1880), Cannan v Earl of Abingdon (1990), Simpson v Teignmouth and Shaldon Bridge Company (1903) and Smith v Kynnersley (1903), to determine whether tolls applicable to carriages could be applied to bicycles — only in Cannan was it so determined, but the courts were required to interpret detailed statutory rules in each case on what could be charged and how much. The Cyclists' Touring Club were behind some of these cases, arranging for all sorts of bicycles, including bath chairs and tricycles, to be driven over the ways concerned to test the legislation. • Pollard v Turner (1912), not cited in Coates v Crown Prosecution Service, but worth a mention, because the offence was committed by sending out on a bicycle a boy to sell bread, contrary to s.7 of the Bread Act 1836, which required 'any cart or other carriage' used for that purpose to carry scales. The difficulty is that all of the cases wrestle with language in legislation enacted in an era before cycling was popular, and bicycles were at best primitive and eccentric. Wikipedia refers to the 'second bicycle craze' in the 1890s (the first craze in the 1860s and 70s hardly meriting the description). It is all very well to look at s.72 of the Highway Act 1835, or s.12 of the Licensing Act 1872, and conclude that Parliament sought to regulate passage along roads by users who were not on foot (or if on foot, were in control of animals). In those circumstances, it was reasonable to assume that Parliament intended to apply the controls — on riding or driving on the pavement, or riding or driving while intoxicated — to a widespread class of users including those unanticipated at the time, viz, cyclists, as they applied to horse riders, carriage drivers, drovers and sumpters. But what of s.193 of the Law of Property Act 1925? S.193 originated as a backbench amendment to what became s.122 of the Law of Property Act 1922, later consolidated in the 1925 Act. It was enacted long after cycling had become commonplace, and over thirty years after s.85 (as enacted) of the the Local Government Act 1888 abolished local byelaws on cycling, declared cycles to be carriages for the purposes of the 'Highways Acts' (certainly including the Highway Act 1835), and required cyclists to carry lights at night and to ring a bell when passing other carriageway users. If horse riding was 'a normal way of taking air and exercise in 1925', so too was cycling. Yet s.193 has nothing to say on the subject. It can hardly be said that Parliament was not cognisant of cycling in 1922, yet it conferred a right of access which, as we have seen, extends to horse riding — and surely includes, for example, swimming (where possible), dog walking and pram pushing — and expressly restricted only the use of 'a carriage, cart, caravan, truck, or other vehicle', a class of things which, in this context, carries a strong implication of heavy conveyances which might injure the common and interfere with the exercise of the rights of access and rights of common. Even if 'other vehicle' might otherwise be said to include a bicycle, the euisdem generis rule of construction suggests that a cycle no more belongs in the class than a skateboard or a scooter. It is no argument to say that mountain biking in the twenty-first century is far more intrusive than cycling on paths in 1922: what matters is the intention of Parliament at that time. This blog does not assert that cyclists are among those who may exercise the rights to air and exercise under s.193 — only that the point is not, in Pannageman's view, free from doubt. Arguably, the same considerations arise under schemes of regulation and management made under Part I of the Commons Act 1899, which typically confer (in the words of the current template scheme contained in the Schedule to the Commons (Schemes) Regulations 1982 (SI 1982/209)), 'a right of free access to every part of the common and a privilege of playing games and of enjoying other kinds of recreation thereon, subject to any byelaws made by the Council under this Scheme.' And whatever the position with legal rights, there can be no doubt that such rights may be regulated, or perhaps even suppressed, by byelaws or limitations to the contrary. And the CROW right of access, which is excluded from a person who, 'drives or rides any vehicle other than an invalid carriage'? Well, in R v Parker, which we met above, a cyclist was a person 'having the charge of any carriage or vehicle' under s.35 of the Offences against the Person Act 1861, although I have not seen a report of the case to ascertain whether the court found that a bicycle was both a carriage and a vehicle. But the CROW restrictions on the right of access in Sch.2 to CROW are imported largely unchanged from the Second Schedule to the National Parks and Access to the Countryside Act 1949, where they applied to land to which access was conferred under an access agreement or order. What is notable about that Second Schedule, however, is a certain assonance with the approach in section 193 of the 1925 Act: neither provision expressly refers to horse riding or cycling. There is no parallel in the Second Schedule to the 1949 Act to para.1(c) in Sch.2 to CROW, which excludes a person who, 'has with him any animal other than a dog' — although the Second Schedule does exclude a person who, 'takes, or allows to enter or remain, any dog not under proper control'. Just as we may infer that the 1925 Act and 1949 Act rights are available to horse riders for want of an exclusion where one might be expected, so the exclusion of carriages (in the 1925 Act) and vehicles (in the 1949 Act) is not necessarily intended to exclude cyclists from enjoying those same rights. Whether the same argument can be spun forward into the CROW Act is another matter. For what it's worth, I can confirm that the small team of civil servants involved in drafting Part I of the CROW Bill did expect cycling to be excluded by virtue of the reference to vehicles. But we shall need a doughty successor to Robert Billson to answer these questions for certain. Hi John. The theme I've explored is that the use of a term in several C19 Acts does not necessarily mean it is intended to have the same meaning in much later enactments, particularly where the scope of that term has evolved in ordinary language. But yes, I take your point. In relation to s.48(4) of CROW, it's hard not to conclude that 'vehicles' includes cycles. If a bicycle is not a vehicle, then cyclists are not allowed on restricted byways, since the rights are for pedestrians, those on horseback or leading a horse, and a right of way for vehicles other than mechanically propelled vehicles. Although we often call them 'urban commons' today, I doubt that, in 1922, the drafters expected s.193 to apply (automatically) only to urban commons: they would have been well aware that Ilkley Moor, and much of the Lake District, was within the area of urban district councils. I think (but haven't researched this) that the original intention of the Society was to confer a legal right of access to all common land, but conceded a more limited right in exchange for a prohibition on fencing commons without Ministerial consent, which meant that it would be almost impossible physically to exclude access to other commons too. No, we don't, and you are right. As you know, I'm for the purposive approach to statutory interpretation, what was the knowledge and statutory intent of the drafters - For example, I can't believe that the intent was to deliver a blanket probibition on perambulators, children's hobby horses, scooters, skateboards and roller skates... and as I have suggested, it would be entirely logical that they would intend to control gypsies and encampments (and I would suggest that the way that the clause includes camping and fires alongside the mention of carriages etc. in the manner it does is supportive of this interpretation) however, as much as I would wish to, I still cannot rule out that they might well have wished to control the use of pedal cycles too, particularly as I suspect the intent of the act at the time, aimed as it was at urban commons, was less likely to have envisaged places like Ilkley Moor or the New Forest as it's core application. Yes, what are now ss.193 and 194 were a response by the Society (for which I now work) and others to the de facto abolition of the manorial property system (copyhold), and the expected rapid deterioration in management of commons consequent on it. The drafting was less than perfect, but a colossal advance in the protection of commons for the public good (rather than commoners specifically). But we still don't quite understand what s.193 was intended to mean… . Interesting commentary in ADM milling ltd vs Tewkesbury Town Council, 2011 at paragraph 48, that suggests just how hard it ay be to ascertain the true intention at the time of enactment: "Sections 193 and 194 were not part of Sir Benjamin Cherry's original scheme for the 1925 property legislation. They were inserted by amendment as the Law of Property Act 1922 was making its way through the House of Lords. They have their origins in an agreement reached between the Land Union (representing landowners) and the Commons Preservation Society. This may explain the lack of precision in the language of these sections compared with the quality of draftsmanship elsewhere in the Act." Hi Kieran, yes I think the concern in 1922 was more focused on gypsy encampments than cycling. Perhaps it's time that the CTC (now Cycling UK) reprised its early C20 role in testing the legislation? A fantastic post Hugh. You rightly highlight what I consider to be a perverse outcome whereby "air and exercise" somehow seems to not encompass cycling. I have always believed that the context of the S193 clause was written to prohibit gypsy encampments rather than to truly to prohibit what was, at the time, a common recreational pastime. Regards CROW, its interesting that clear provisions were put in to allow Schedule 2 restrictions to be suspended in order to permit horse or cycle access, something that it appears has been rarely if ever utilised.